I am so excited for Spring fashion!!! It has been such beautiful weather here in the OC and I'm ready to bring out all of my Spring looks. Today I wanted to share with you some new trends that I think will last all season long!! 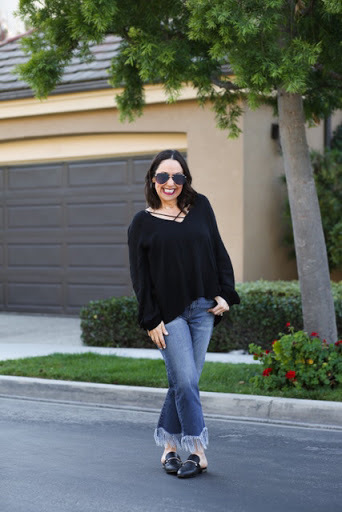 Have you seen these fringed hem jeans? They are EVERYWHERE! And I have to say I'm in love with them. They add some personality to otherwise basic skinny jeans. I picked up these from Topshop and decided to pair them with a basic Lush shirt. Remember, when you are embracing a new trend, make that part of the outfit the focal point and keep the rest basic. I then added these mules, which is another Spring trend. I love this Steve Madden version of the Gucci originals. They are so comfy and perfect with shorter hemmed skinnies!! I hope you try out some of these spring time trends. Let me know what you think in the comments and stay tuned for more upcoming posts on Spring fashion!! Thanks to @photobyvincent for photos. Please read my post here about how to shop my looks with the new LIKETOKNOW.IT app. You can also shop by clicking on the links above. Happy Reading!!!! Gorgeous jeans, love the hem! Look at you all cute on the curb!! I love this trend right now. 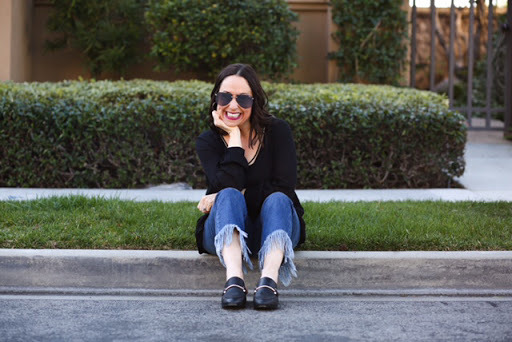 The frayed hem is so so fab, but not as fab as you! Love you friend! !